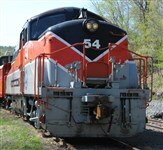 Enjoy a ride aboard the Stourbridge Line, offering scenic views in the Northern Pocono Region. We will board the train in Honesdale and head to Hawley and back, traveling along Laxawaxen River where you just might catch site of a bald eagle or two ! Following the relaxing train ride, we will stop at the quaint Settlers Inn in Hawley for a wonderful fulfilling buffet lunch. The buffet meal will include mixed green salad, grilled chicken over wild rice, grilled beef sirloin over sweet potato hash, seasonal vegetables, fruit salad and an assorted dessert platter. Coffee, tea, water and sodas are also included. Following our lunch, we will head to Dorflinger Factory Museum in White Mills, PA. The museum houses an extensive collection of glass produced by the Dorflinger Factory in the late 1880's into the ealry 1900's. The museum consists of the Factory Office building and the Lower Cutting Shop. Built in about 1888, the Factory Office building is a wonderful example of early Pennsylvania cut bluestone construction with beautiful chestnut and cherry woodwork. Build in 1883, the Lower Cutting Shop is a large three-story rectantular Pennsylvania bluestone building that housed part of the cutting department during the factory's operation. The fully restored "Green Room" was the factory showroom during the last years of the company's operation and now contains a detailed scale model showing all aspects of the glass cutting and engraving process. Following the factory tour, we'll head home.